It might smack of indulgence to cook squash, sweet enough already, with something as sugary as maple syrup, but it works an unexpected kind of magic. Serve with something decidedly savoury, such as a slice or two of good gammon. Use two small butternut squash if you can't find acorn. 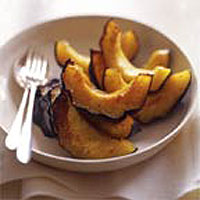 Arrange the squash halves, cut-sides down, in an ovenproof dish or roasting tin. (Alternatively, cut the halves into wedges and put them in the tin). Pour in enough water to cover the base of the dish. Bake for 25 minutes. Meanwhile, put the syrup and butter in a pan over a low heat until the butter has melted. Turn the squash cut sides up (or flip over the wedges), and spoon some of the maple-butter mixture over each one, making sure the cut-sides are well doused. Season with salt and pepper. Bake for a further 30-40 minutes, basting occasionally with the buttery syrup, until very tender, and patched with brown. Serve hot or warm.